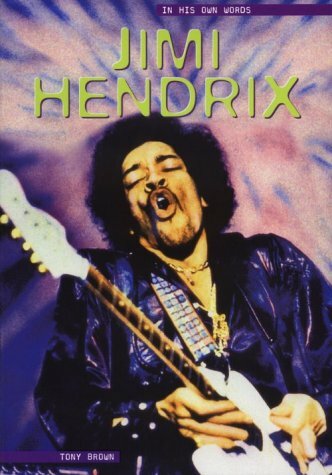 Quotes from "Jimi Hendrix: In His Own Words"
Thread: Quotes from "Jimi Hendrix: In His Own Words"
I read Jimi Hendrix: In His Own Words by Tony Brown again this weekend for like the 1,000th time. I decided to post some passages that may suprise you. Since these are word for word excerpts from Jimi, they may seem erratic but that's just how Jimi talked. Please post your opinions and comments. If you like these I’ll post some more in the future. Check out the picture also... it cracks me up every time! “I wish they'd had electric guitars in cotton fields back in the good old days. A whole lot of things would have been straightened out. Not just only for the black and white, but I mean for the cause! Well, it's so funny, because even some Colored people look at my music and say, `Is that white or black?' I say what do you want it ...you know, what are you trying to dissect that for? Try to go by the feeling of it. Just because it's loud. “Far as I like, I like after hour jams, like in a small places, like at a club or something. Then you get another feeling and you get off in another way, you know, with all those people there, you know? You get another feeling and then you mix it in with something else that you get. I don't know. I get more of a dreamier thing from the audience, you know, it's more of a thing that you go off into. You know, you get into such a pitch sometimes that you go off into another thing and, you don't forget about the audience, but you forget about all the paranoia that, you know, you said, `Oh gosh, I'm on stage , what are we gonna do now?' Then you go off into this other thing. Then it turns out to be like, almost like a play, only in certain ways though, you know, you have to look at it in different ways for instance. Last edited by tremoloman; August 6th, 2006 at 04:49 PM. that one about the first band was nice... i have a book about Hendrix myself, and I could find some of the same quotes here.. Nice Trem. Very cool to see Jimi with a Rickenbacker! I've heard the second compliment quote on an interview I saw on youtube - http://youtube.com/watch?v=O8E0fZ8Jsl8. Oh ya, me too! That is one of the best combinations in the whole universe. They go so well together don't you think? I know what he means but I've never heard anyone put the two together quite like that.